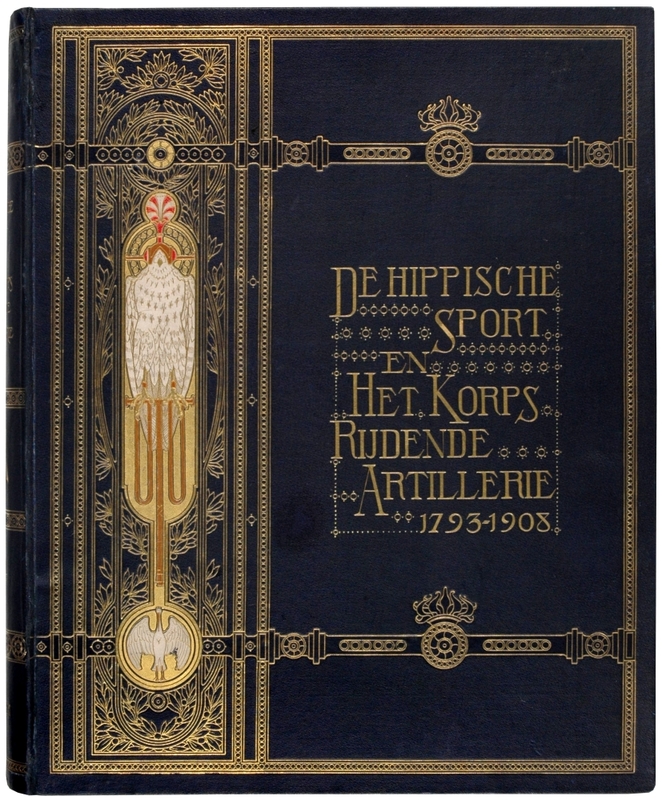 De hippische sport en het Korps Rijdende Artillerie 1793-1908, I: DE VALKERIJ. Met illustratiën van Hoynck van Papendrecht, Krabbé, Staring en van Es en ornamentatie van Colenbrander en Roskam. Arnhem, Coers & Roest - G.J. Thieme, (1908). 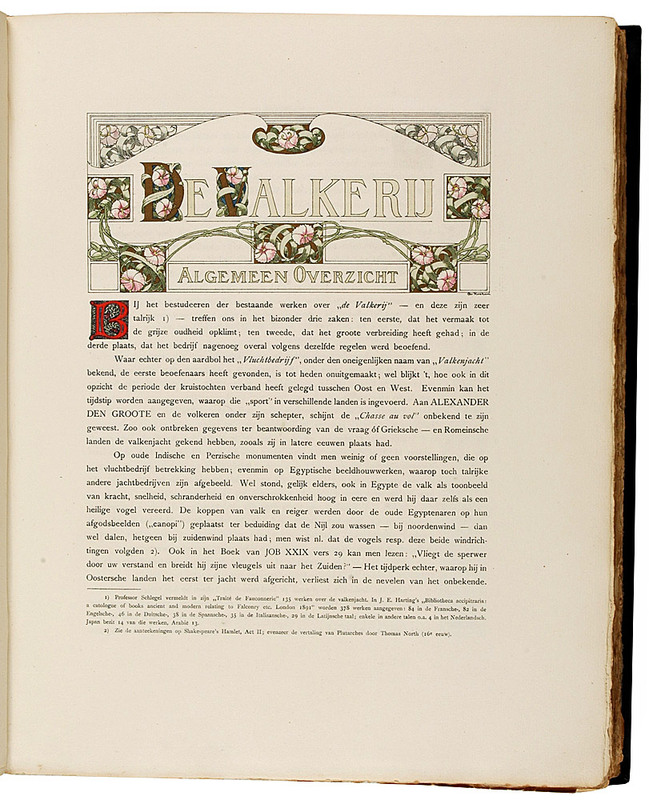 Folio (370 x 290mm). pp. 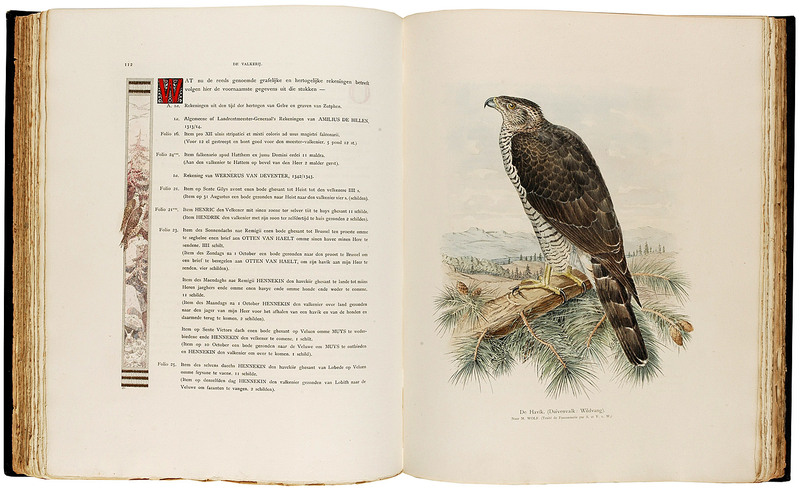 (16), 172, (18), with 45 plates of which 34 beautifully handcoloured, many of the plates with coat of arms of the Royal Family in gold and silver, many handcoloured figures in the text, numerous richly ornamented handcoloured text borders, painted partly in gold and silver showing falcons, initials painted in red. 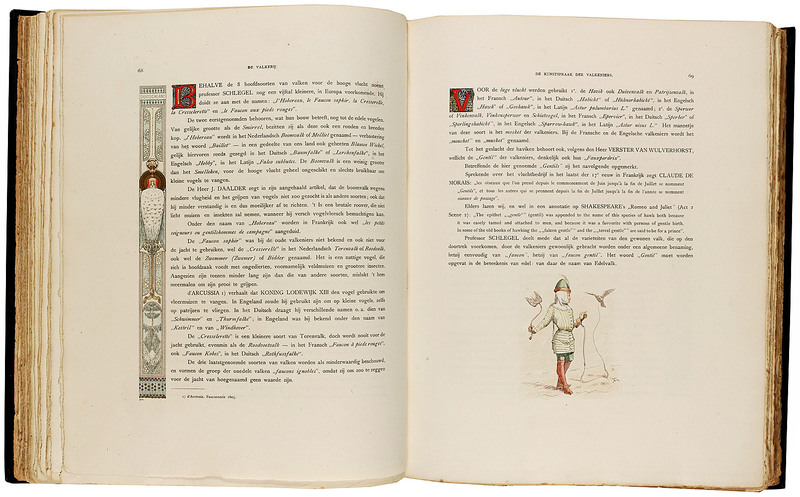 Original extensively gilt pictorial full cloth. 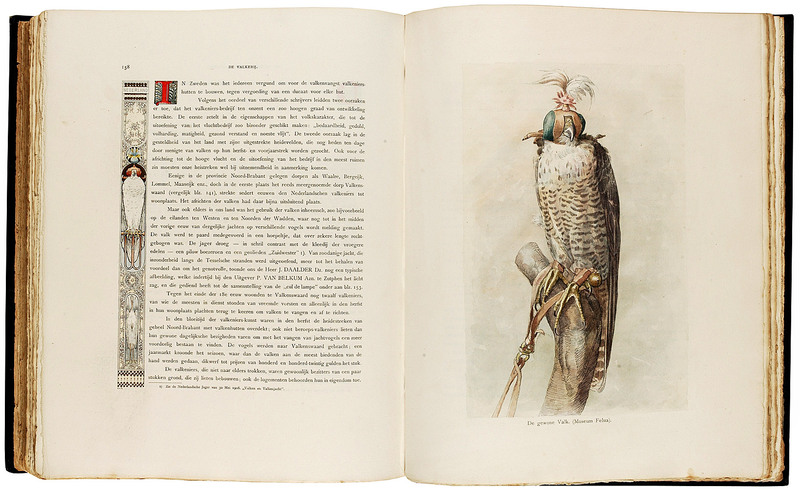 The rarest Dutch book on falconry. 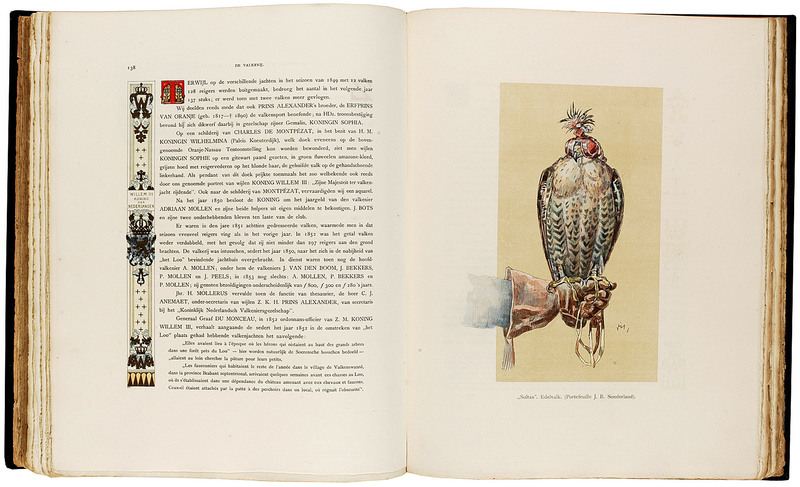 Only a few copies were printed for the Royal Family and Members of the Royal Loo Hunting Club. 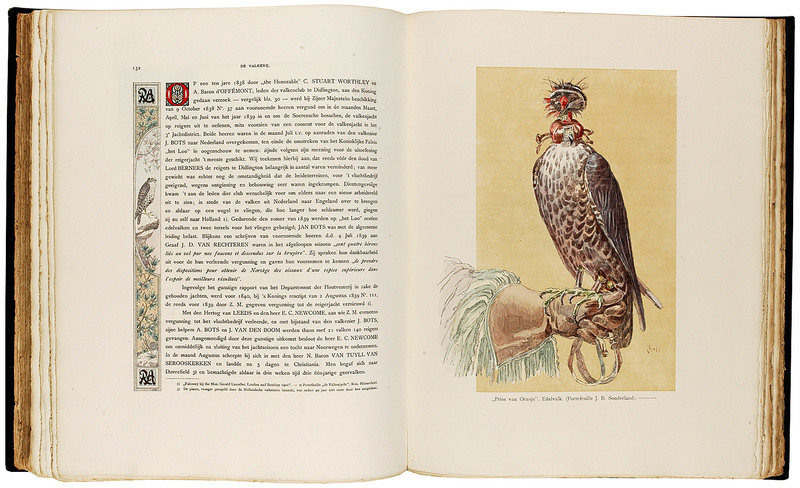 Together with Schlegel and Vester van Wulverhorst's 'Traité de Fauconnerie', the most impressive work published in the Netherlands on Falconry. 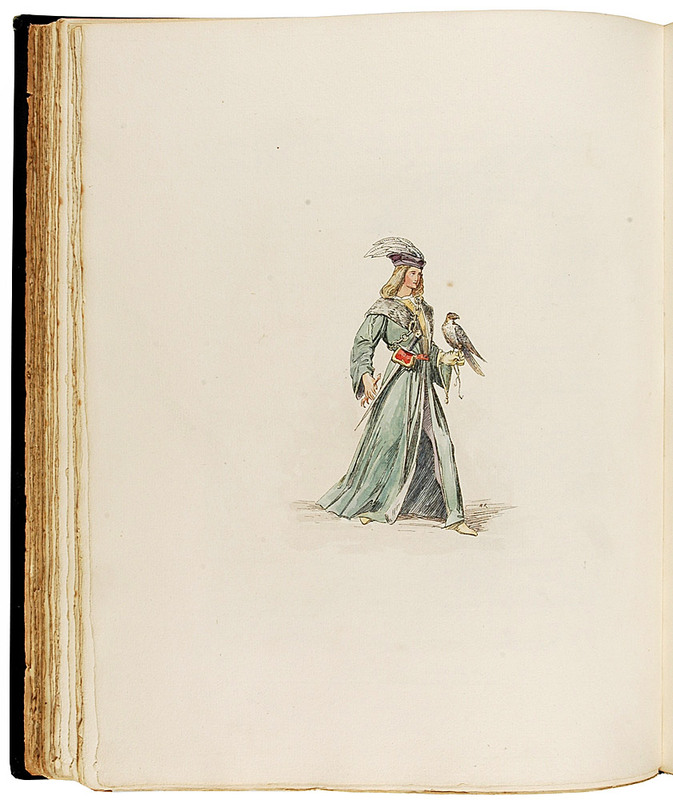 Printed for private circulation only (as stated on the title page), this sumptuously produced work with the ornaments heightened in silver and gold is virtually unknown and not cited by bibliographies. 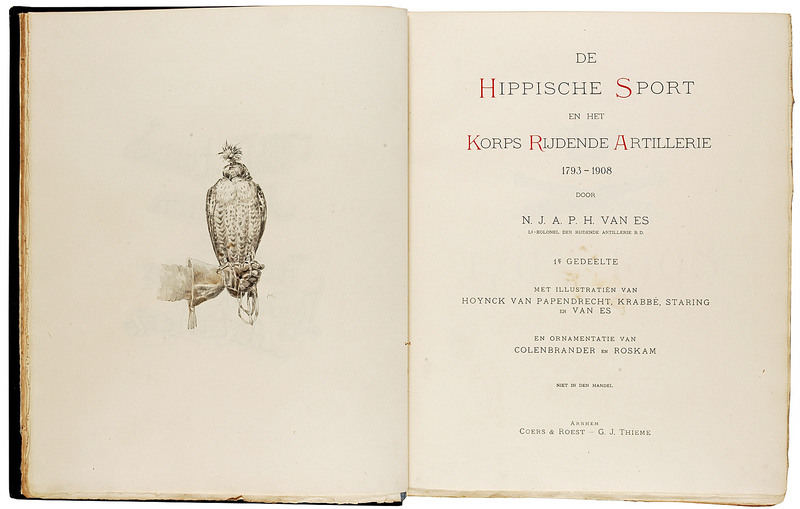 The present copy has a written dedication of the author Van Es to Otto Eerelman, famous Dutch painter of horses. 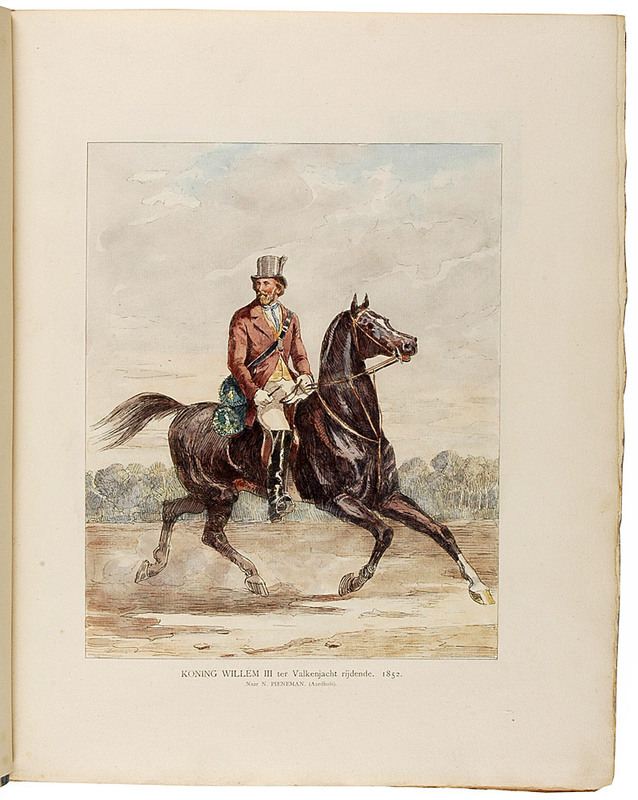 The first 54 pages describe the life of Prince Alexander of the Netherlands, who died at the early age of 29, and who was the president of the Royal Loo Hunting Club, and a keen hunter. 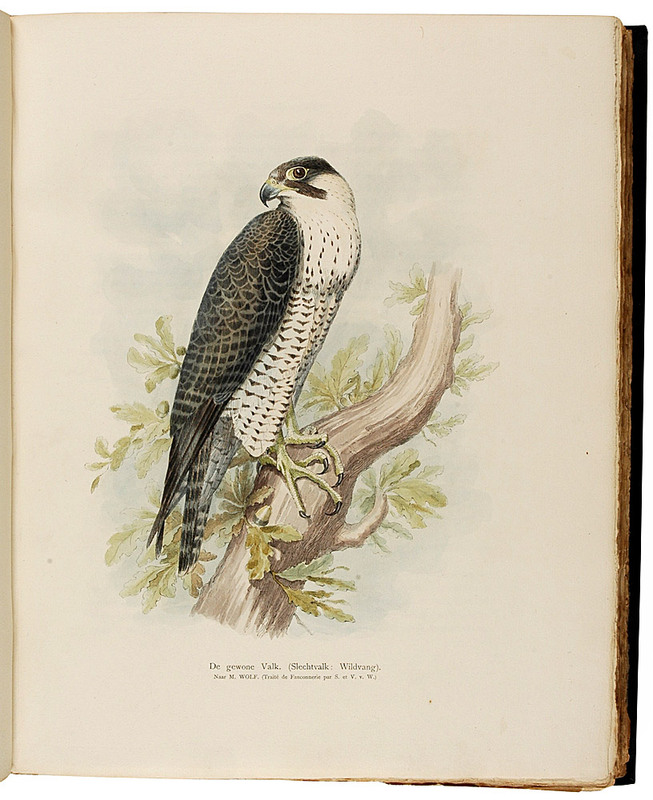 The majority of the attractive handcoloured plates and figures show falcons, hunting scenes and hawking attributes. 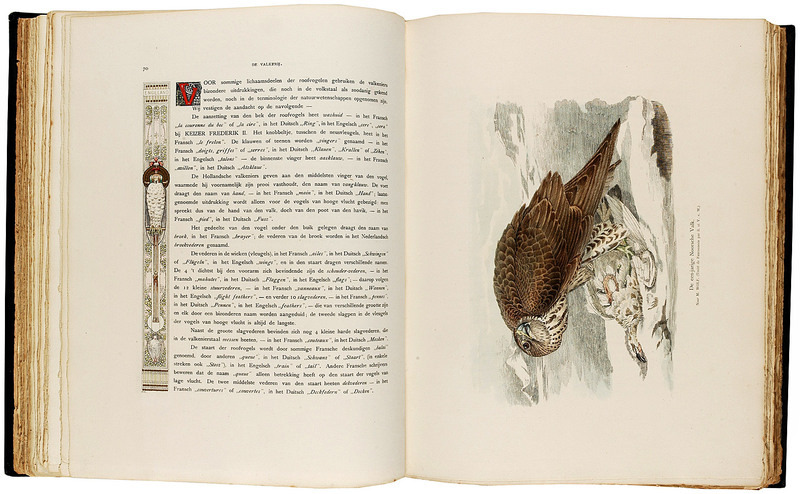 The book has chapters on falconry in France, Germany, England and the Netherlands as well as a large chapter on the Monarchs of Oranje-Nassau and falconry. A list is given of the members of the Royal hawking club. The list consists of 31 Dutch members of which the majority is nobility as well as members of the Dutch Royal Family and 25 non residing members. 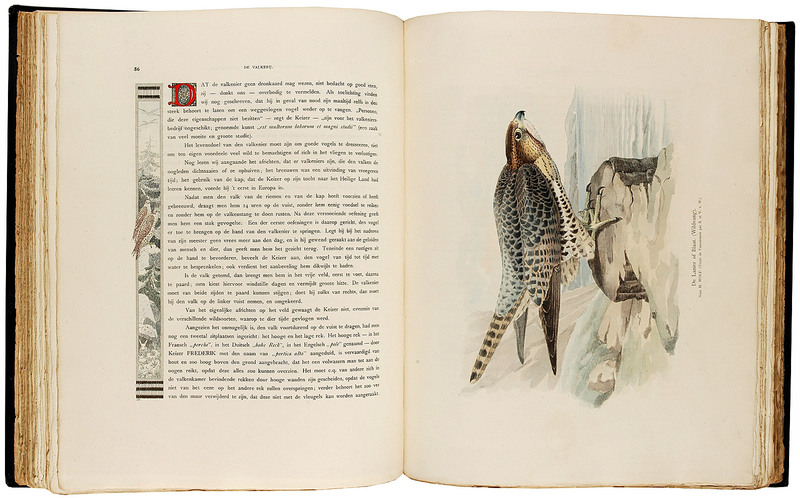 The second volume of this publication seems to be less rare and treats military matter. An uncut and very well preserved copy. 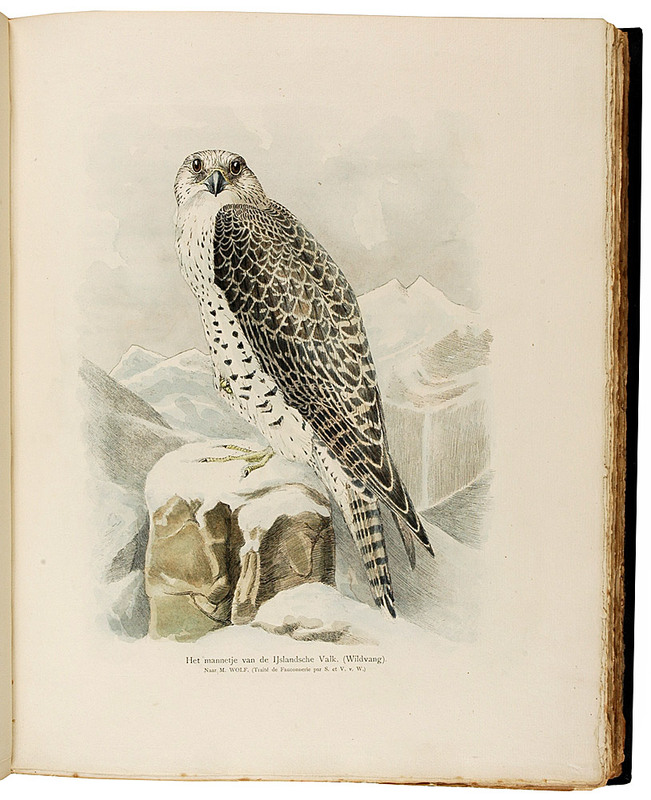 There is a copy in the Royal Library in The Hague from the famous falconry collection of A. Swaen.